Bridges are among the most important structures that engineers may design. Knowledge of forces and the way they are distributed allows engineers to design bridges with the least amount of materials and the highest possible strength. What factors to they consider? How the forces are distributed? Without the knowledge of bridge design, one may try using the highest amount of strong materials in order to make s strong bridge. Many bridges collapse because they cannot resist the pressure of their own weight. In this engineering investigation project you will discover the rules by your own initial experiments and then use your knowledge to make a bridge that is light and strong. In your demonstration you will show that your bridge can carry loads that are many times more than its own weight. This is an engineering project. Engineering projects do not use Scientific Method and many not have a question, hypothesis and variables. More details or support for this project is available for the members of ScienceProject.com web site. 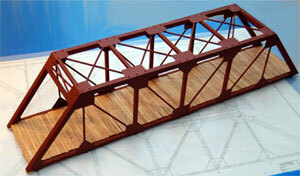 Materials needed for making a model bridge may be obtained locally or purchased online.